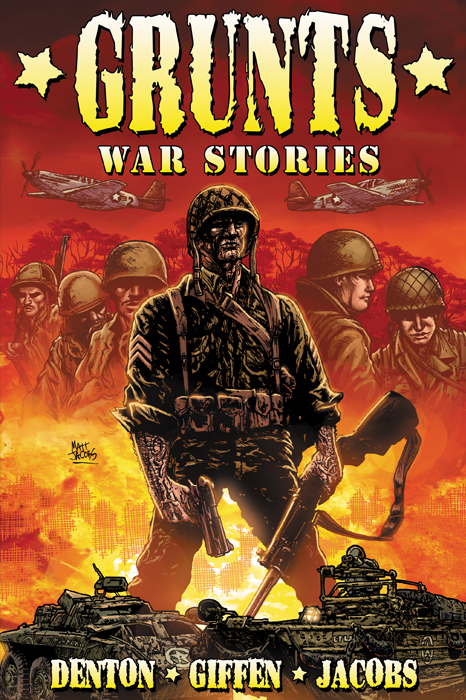 Just wanted to let everyone know that GRUNTS: War Stories (Arcana Studio) is in January 2010 Previews Catalog PAGE 194. Please pre-order this fantastic collection of back stories written by amazing writers and a script monkey (that would be me). I wrote a story titled: Iron Snake in the Desert; yes, many have pointed out the many meanings of that title. Honestly, that never crossed my mind. Wonder if it popped into Shannon's? I'll have to ask him about that. This was a very fun piece to write. When Shannon (Denton) asked if I would like to contribute to a back story for the his and Keith Giffen's mini series, Grunts, I didn't have to think long before saying yes. There were challenges in researching both the original material and WWII facts. As I was looking for inspiration I found a picture of a private riding on a top of train loaded with a mix bag of bombs and what have you. It was nutty. There he was there sitting on a box of them, smiling away and posing for the camera with his rifle in hand. That set my mind off (heh). The train became my backdrop for my story and...well, come back in a bit and I'll tell you more. First, tell your local shops and friends to get this puppy, er collections of stories! Click here for a preview. I'll go see if I can find that photo for you folks in the meanwhile. During World War Two, American squad encounters a German superhuman assault squad and starts a Eugenics Race that carries into present day. 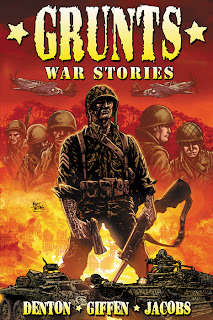 Collecting the War Stories of Grunts there are contributions from Kevin Grevioux (New Warriors), Christopher E. Long (Wetworks), Dwight Macpherson (Archibald Saves Christmas), Howard Wong (After The Cape), Marc Bernardin/Adam Freeman (The Authority), Mike Bullock (The Phantom), Jimmie Robinson (Bomb Queen), Rob M. Worley (Scratch 9) and many more!